Ashford Web Services give us an insider’s view of their involvement with the Festival! There are many people who give up their time to help out the festival, in varying forms. Friend of the Festival Gary, has built this amazing Website for the Festival and aided organisers with our Social Media platforms too. Being a local company, it is great to have Gary on board, and if it was not for him you would not be seeing this great page! So Gary, tell us how you are involved with the Festival? I’ve known Edward for many years and he got me onboard a number of years ago, to help with the website, social media and poster design. I was more than happy to become involved and I’ve been doing those things ever since. In fact I now have my own AFITP Personal Assistant Samantha, who has been extremely helpful with this year’s website and social media content. How long does it take to build a website like the one you have created for the Festival? That’s a difficult question to answer because every website is different and there’s so many parameters involved. I used to code websites from scratch using HTML, CSS and VB Script. However I recently switched to WordPress, which is a fantastic web development tool and significantly cuts down the time it takes me to build websites. A simple website would take a couple of days, whereas something more involved, such as an online shop, could take two to three weeks. Alongside your Web Design company you are also playing at the Festival this year, tell us about that? I’ve played at the festival a number of times over the years, usually in a different band each time, much to Edward’s amusement. This year I feel extremely honoured because I’ll be playing bass for Legacy, which was a band set up by the late Martin Judd who sadly passed away last year. Martin was very well known among the local music community and is extremely missed by many people. I feel very proud to have been invited to take on bass duties for a great bunch of guys, all of whom are extremely talented musicians, in order to keep Martin’s Legacy going. And what makes this year’s festival all the more special is that Legacy will be opening up on the Friday night on the Martin Judd Stage. What an absolute tribute and a great way to start the festival. So where can we find out more about Ashford Web Services? I have my own website www.ashfordwebservices.co.uk, which showcases some of the websites I have built and worked on. It gives details of the services I offer and how to get in touch with me. My office is currently home-based, which means low overheads that result in very customer-friendly prices. As well as building websites for small businesses, I also take care of website maintenance and Search Engine Optimisation. A lot of my recent work has come from companies with existing websites that required modernisation, including a fresh look and feel. 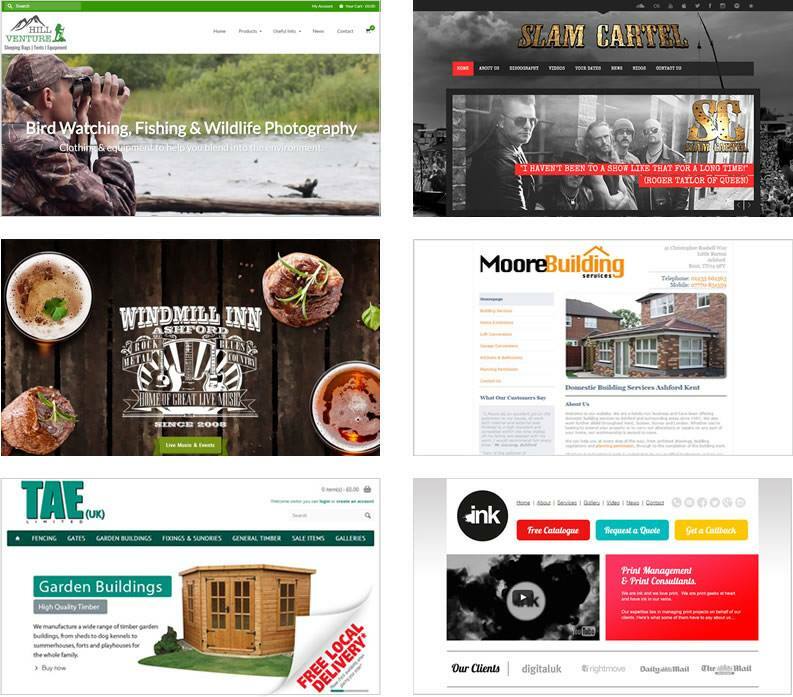 Any website that I build now is ultra-modern and ‘responsive’, which means it will automatically adjust to best fit whichever device is being used to view the website, whether that’s a mobile phone, a tablet such as an iPad, or more traditional PC’s and laptops. Most web browsing is done via mobile devices these days and it’s vital that users get the best experience possible. Another huge advantage of a WordPress website for the customer, is the ability to make their own updates and changes to their website moving forward, therefore saving them the need to pay someone such as myself to do that. This is because WordPress is a Content Management System that is reasonably easy to use (as I’m sure you can vouch for because you picked up how to use it in no time at all and have therefore saved me absolutely hours). A few examples of Gary’s amazing work!